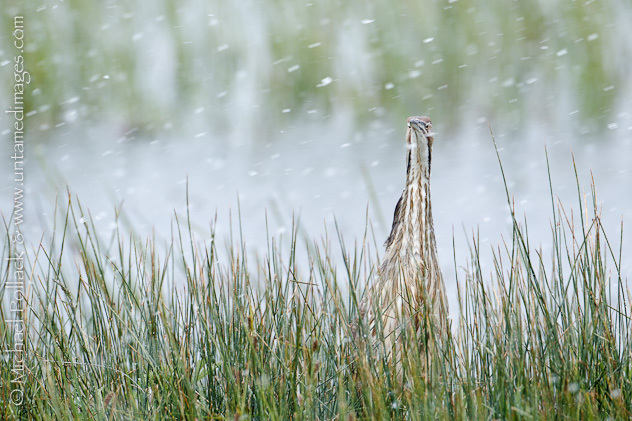 An American Bittern (Botaurus lentiginosus) does its best to ignore the falling snowflakes while prowling for rodents. During a trip to the Sierra Nevada Mountains last month, Alison and I were blessed with a late spring snowstorm. I say blessed because unusual or severe weather often leads to dramatic photographs. Case in point is the American Bittern pictured above. This normally secretive bird species usually spends its time hunting deep within dense, reedy wetlands where one is fortunate to even get a glimpse of it. Perhaps it was because of the inclement weather that we were lucky enough to observe and photograph this bird for over an hour at close range. It was busily hunting for unwary rodents and mostly kept in full view in an area with only sparse reeds. You can see this photo and more from the trip by clicking on this link and then by clicking on the “Sierra Birds” thumbnail. The gallery includes photographs of Yellow-Headed Blackbirds, Sandhill Cranes, and Marsh Wrens which were all busy with spring courtship behavior. One particular Marsh Wren tugged at our heartstrings, as we watched him sing virtually without stopping for four days, even while constructing a nest many times his own body weight, but sadly without attracting a willing female. Perhaps he found Mrs. Right after we left the Valley.